The Squamish are a coast Salish people whose traditional territory stretches from Point Grey in Vancouver to Roberts Creek, encompassing all of the islands in Howe Sound, including Bowen Island. The Squamish name for the Island is Xwlíl’xhwm, meaning “Fast Drumming Ground”. Some authors attribute the name to the sound made by the ocean as it passes through the tiny pass between the Island’s northern point and Finisterre Island. In the Squamish creation story, Xwlíl’xhwm is often referred to as the place where the deer were created. here they hunted, fished or stopped over during long voyages up and down the coast. While there remains no trace of the village, archaeological surveys conducted by Dr. Charles Borden and a team of students from the University of British Columbia in the 1970’s discovered clam middens at the perimeter of the Island. More recently, a developer’s survey unearthed a fire pit and arrow head. The whole Island is thought to have high potential for such sites. For nearly a century before it was settled by Europeans, Bowen Island was an unlikely pawn in the game of empire being played out between the Spanish and the British on the world stage. The island was charted in 1791 by explorer José Maria Narváez, who named it “Isla de Apodaca”. Sailing from San Blas, Mexico in the Santa Saturnina, Narváez was under the orders of viceroy Juan Vicente de Güemes Padilla Horcasitas, who was intent on expanding Spanish influence in the Pacific Northwest. Narváez spent a mere 22 days charting and naming places from Rosario Strait to the Sunshine Coast. Few of the names he dispensed remain, but Apodaca Park on our eastern shore commemorates our second naming. We have Napoléon Bonaparte and Admiral Lord Nelson to thank for the fact that Bowen is now called Bowen. Had Napoléon not entered Spain in 1808 and cut off its colonial supply routes and had Nelson not crippled the French and Spanish combined naval forces in the Battle of Trafalgar, Britain might never have wrested the Pacific Northwest from Spain. Bowen Island was renamed in 1860 in honour of Rear Admiral James Bowen, who was master of HMS Queen Charlotte during the battle of “The Glorious First of June” . The Rear Admiral was reputed to have taken his ship so close to the stern of the French flagship Montagne during this sea battle that the Montagne’s flags brushed the shrouds of the Queen Charlotte as Bowen poured shot into her. The assignment of this name to Bowen Island may have represented a long overdue honour for the Rear Admiral and an acknowledgment of past wrongs. James Bowen was notably not among the names listed for ‘special honour’ in an official report of the battle, likely prepared by Admiral Sir Roger Curtis. Curtis’ report failed to mention several other captains and resulted in a furore that continued decades after the battle. Why Admiral Sir George H. Richards, the master of HMS Plumper, should have chosen to bestow names from the Glorious First upon arriving in the area is not immediately apparent. He was, however, clearly operating on a theme: Admiral Lord Howe, Admiral Alexander Hood, Admiral Sir Roger Curtis, Admiral Sir Thomas Pasley, Vice Admiral Lord Collingwood, Admiral Alan Gardner and Capt. John Hutt were all honoured in the same battle. Their names remain on and around Bowen where the Plumper placed them, on Howe Sound, Hood Point, Cape Roger Curtis, the Pasley Islands, Collingwood Channel, Mt. Gardner and Hutt Island. Anxious to settle its colonies, Britain introduced a system of land pre-emption in 1859 for vacant Crown lands. Settlers willing to clear and fence land, build a home and produce crops could claim title to the land. The first settler to pre-empt land on Bowen did so in 1874. From that time until the turn of the century, Bowen was a hive of industrial activity. Early settlers planted extensive farms and orchards, the Island was selectively logged between 1896 and 1899, and a brickworks was established on a rare blue clay deposit found in Deep (Mannion) Bay. On logged-out lands in Tunstall Bay, the Western Explosives Company set up a dynamite plant. 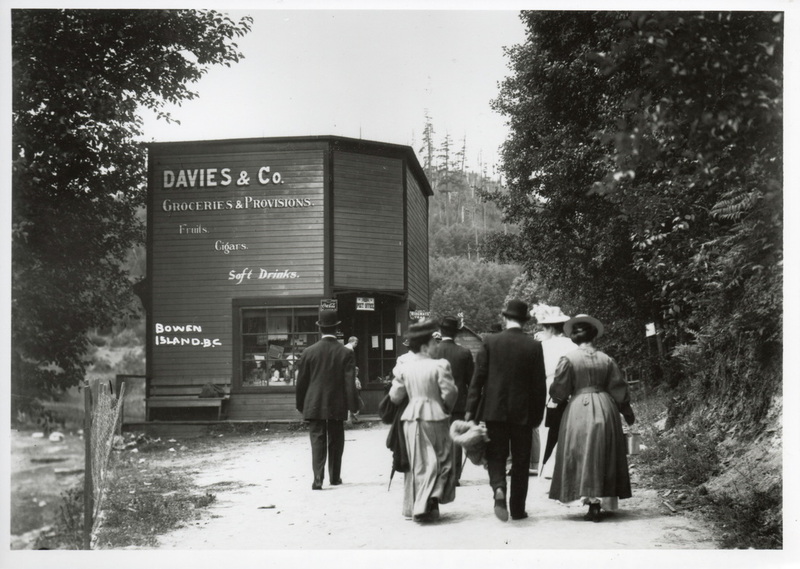 One of the early settlers was William Davies, who pre-empted 33 acres of land at the head of Snug Cove in 1887. There, he planted a five-acre orchard and established a business selling fruit, game and sundries. The remains of Davies Heritage Orchard lie in the heart of the modern village of Snug Cove, as part of a large park that surrounds the village. Some of Davies’ original trees remain and Bowen Island Heritage Preservation Association has restored the area with new trees of the same varieties as those he planted. 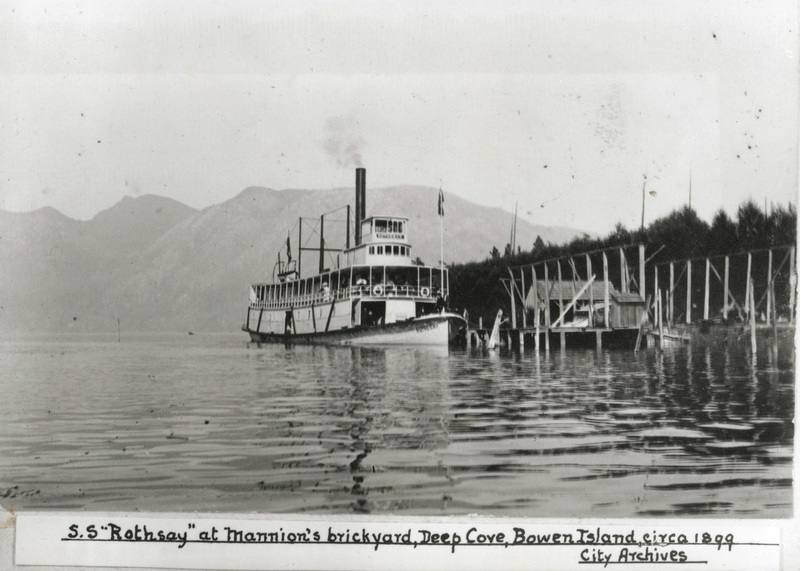 Coastal steamers carried goods to and from Bowen via docks in Snug Cove, Cowan Point and Miller’s Landing. It was aboard those early coastal packers that the first tourists arrived. By 1900, the enterprising Captain John Andrew (Jack) Cates recognized Bowen’s potential as a tourism destination. Cates had been operating a ferry passenger service in Howe Sound, with stops on Bowen Island. He bought the Mannion estate in Deep Bay and in 1902, he formed the Terminal Steamship Company. Its new flagship, the SS Brittania, carried 300 passengers and was soon joined by a fleet comprised of the steamships Bowena, Belcarra, Ballenas and Baramba. The latter were smaller, combined passenger/cargo vessels, offering a basic ferry service that brought countless church, club and company picnickers to Bowen. A carousel built by steam engineer Jacob Dorman (who was one of the Island’s earliest settlers) was set up on Snug Point. Playing fields, baseball diamonds and a tea room were among the earlier amenities offered. William Davies catered to some of the tourist trade as well. 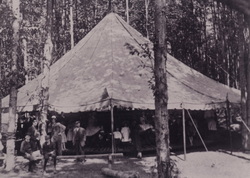 In the early 1900’s, he began setting up wooden platform tent sites in his Orchard and supplying camping gear. 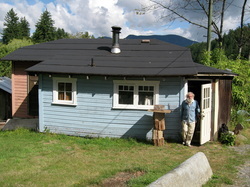 Cates continued to acquire land on Bowen Island and built the Terminal Hotel, more picnic grounds, a farm, store and bakery. Overnight tourism quickly became popular and he added simple cabins to rent by the week. The profitable operation came to the attention of the Union Steamship Company, which had begun operations in the Pacific Northwest in 1889, expanding into Alaska during the Klondike Gold Rush. In 1920, “the Union” bought Cates’ Bowen holdings and began to renovate. The hotel was enlarged and re-named Mount Strahan Lodge. Fine clay tennis courts were added. A salt water “pool” was created in Deep Bay, between the causeway and Sandy Beach, by surrounding the area with large logs. Much later, in the 1950’s, a freshwater pool was built near the hotel. Over 100 ‘bungalow’ and 50 ‘camp’ cottages were built in Deep Bay and around the Lagoon. A dance pavilion, said to be the largest in British Columbia, was built on Snug Point, near the ferry landing. It could accommodate 800 couples on its sprung-wood floor. The Union staged its grand opening of the refurbished hotel and dance pavilion on the 24th of May, 1921. Business went well and by 1923, the company commissioned a new flagship to be built in Scotland. The Lady Alexandra arrived in service in 1924 with tons of Scottish sand in ballast, which was placed on “Sandy Beach” in Deep Bay. Capable of carrying 1400 passengers in true luxury, the Lady Alexandra offered daily cruises to Bowen Island for $1 and advertised popular summer evening dance cruises on Wednesdays and Saturdays. Passengers could dine, drink and dance on board, a novelty in Vancouver until well into the 1950’s. In addition to the Lady Alex, the Union operated the Lady Cynthia, Lady Cecilia and Lady Evelyn on the Bowen Island run. By the 1930’s, in addition to the day-visitors, families were returning to rent the same cottages for the entire summer season. Many visitors to Bowen today have stories of happy summers spent in one of the cottages. Tourism peaked between 1937 and 1946. The Lady Alexandra alone recorded 137,000 passengers in 1937 and in 1946, 101,000 visitors were said to have arrived on Bowen via one of the Union’s “Ladys” or by Sannie boats from Horseshoe Bay. In 1941, the Canadian Pacific Railway acquired a controlling interest in the Union, only to sell it when tourism began to fall off after the Second World War. Many factors influenced the decline in coastal tourism at that time - the increasing popularity of the personal automobile is certainly one of them. 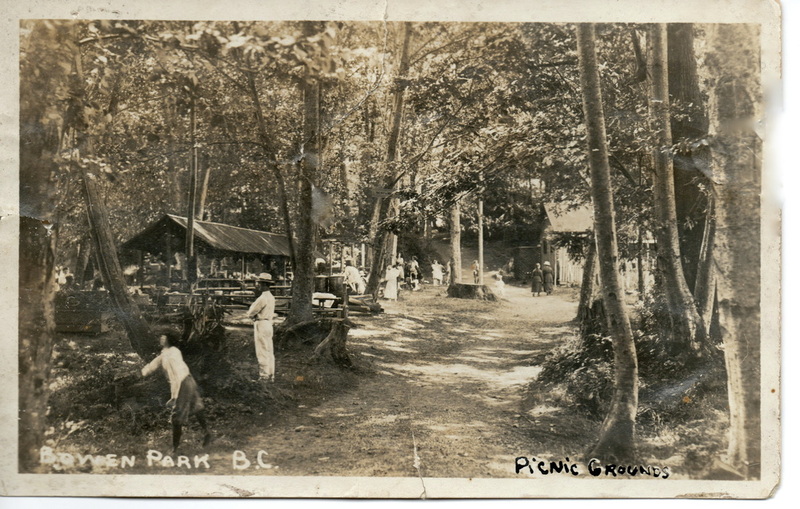 CPR sold its interest in 1955 and in 1956, the Union lost its Bowen Island franchise to the Black Ball Ferry Company. In 1959, the Union fleet was sold to Northland Navigation. For many years the Lady Alexandra was a floating restaurant in Coal Harbour, Vancouver, but in 1980, she was stripped and then scuttled in Redondo Beach, California. The hotel was closed in 1957, but new owners of the Bowen holdings were intent on marketing it as an exclusive international resort. The venture, known as “Evergreen Park Resort”, never really got off the ground but succeeded in alienating Islanders by closing off the property’s trails and other amenities. The hotel was demolished in 1962 and many of the cottages sold for $1 to anyone who would take them away. Some of the land was subdivided and sold, some of it with cottages in place. Other cottages, including those in Davies Orchard, were rented. In the 1970’s, Stan James acquired the remaining Union lands and proposed building an upscale resort with skiing on Mount Gardner and condominiums overlooking Killarney Lake. His scheme was foiled by creditors, including Crippen Engineering, who seized the property. Such schemes were instrumental in the creation of the Islands Trust in British Columbia to protect the unique amenities of the islands for the benefit of all citizens of the province. 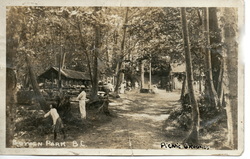 In the late 1970’s the Bowen Island Park and Store Use Society was formed. They lobbied for saving the old general store and acquiring Union Steamship land for a park. They succeeded in raising funds to restore the store, which was moved from its original site. Today, that building is well used as the community library. The Greater Vancouver Regional District purchased the former Union land in 1983 and named it Crippen Regional Park. With the land, it acquired the remaining cottages and their tenants. The tenants were allowed month-to-month rentals, but those were gradually phased out. Bowen Island Heritage Preservation Association was formed in 1989, motivated by the desire to protect the cottages as a heritage resource. Only 12 cottages had survived as vestiges of the era of the Union. Over the years, others had been lost to demolition or accidental fires. Two of the 12 cottages were purchased by the new Union Steamship Company Marina and the GVRD planned to demolish or relocate the others. In 1991, they decided to demolish cottages 15 and 16 and brought in a bulldozer. Bowen Heritage documented the needless destruction and rallied the community against further demolition. We entered into a joint management agreement with GVRD to protect the remaining cottages and honour their heritage significance. Bowen Heritage is deeply indebted to a number of sources for the information used to create this very brief summary of our Island's many stories. Foremost among those, we wish to acknowledge and thank our member, Marion Moore, whose encyclopedic knowledge of our history and care and attention to detail has ensured that this website presents an accurate picture of the times.